Knife tattoo is a common type in the tattooing culture. You can find it in many tattoo styles and was popular since the 20th century. Unlike the swords or daggers, knives didn’t disappear from our everyday life. Although we no longer need to carry the knife with us everywhere we go, it is still one of the most practical tools man has ever made. For our ancestors, it was a vital tool for survival and protection. But today, the value of the knife in everyday life is much smaller. However, it has the same meaning as it had 500 years ago, and it’s a perfect choice for a tattoo. 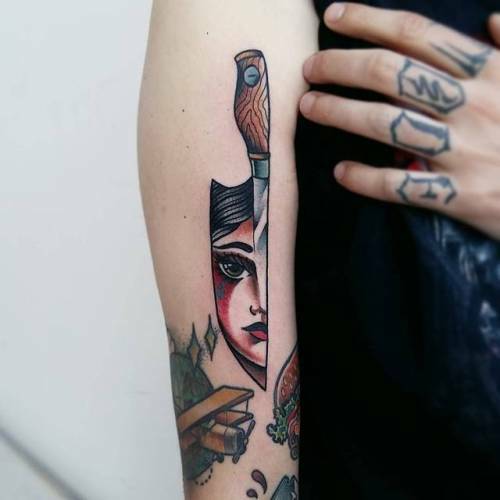 Let’s take a look at the most fantastic knife tattoos. It was the essential tool for many cultures throughout the whole world. The knife was a weapon, an everyday object and in some cases even a ceremonial tool. It is one of the oldest weapons in the human history. In fact, the sword was a much later development of the knife with an attempt to make it more powerful and more deadly. During the middle ages, every knight and soldier always had to carry a knife if they would lose their sword. In the situation when you lose your primary weapon in the middle of the fight, this small knife was the only hope to save your life. But the knife was not only a weapon, but it was also one of the first human-made tools. Our ancestors used it for almost everything. They slaughtered the animals, peeled the skin, chopped the meat and used it for many other small tasks. For more than two-and-a-half million years, it was the most critical tool for the whole of humanity. Yup, the oldest found knife is that old. Humans used stone knives way before they learned how to process the iron. Later on, the knife became a symbol of social status. Rich and powerful people had knives with decorated handles and hold them in cases wrapped-up in the expensive metals. Meanwhile, the poor used simple knives with cheap wooden handles. It’s probably the most common archeological find throughout the whole world. Every nation, tribe, culture had a knife at least in some form. The first tools were wooden, later came the stone age and finally, people discovered how to extract and process the iron. During the whole history, the knife was not only an everyday object and weapon but also had a profound symbolical meaning. For example, the ancient Aztecs used ceremonial knives to perform their creepy human sacrifices. During these bloody ceremonies, they used it to take out the heart from the victim’s body and to sacrifice to their gods. Thus, the ceremonial knife became a symbol of the fear and anger of the gods. In Persia and many other ancient Middle East cultures, knives also were a unique tool to perform sacrifices for the gods. Only in their case, the victims were usually the animals. Many other cultures used the knife as a ceremonial tool during the rituals. Therefore, the image of the bloody knife always symbolized death. Thanks to the Hollywood movies, the image of a sneaking soldier with a knife towards the victim has stuck in our memories for the rest of our lives. And yet it is a deadly weapon for close combats and if used by professional hand – does not cause any noise. The knife is a widespread symbol in the army patches. It stands for the speed, strength, and ferocity. While there are many knife tattoos, we decided to list the most popular and common ones. See the list below. As we’ve mentioned earlier, a knife with blood is a universal symbol of death. 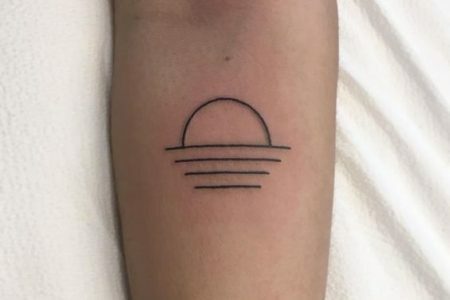 However, this type of tattoo on a person can say ‘I have a knife, and I’m not afraid to use it.’ It embodies your bravery. It’s a classic old-school duo that symbolizes pure death. It can also express a total defeat or may serve as a talisman for protection. Until today, in some prisons, a knife and skull tattoo may indicate that the inmate is a murderer. Stabbed or pierced in the back – is an expression of betrayal. A heart pierced with a knife is a symbol of infidelity and broken love. On the other hand, it may symbolize the never-ending search for true love. This tattoo represents that the person has gone through emotional or physical pain in his or her life. There are many reasons to get a knife on your body. 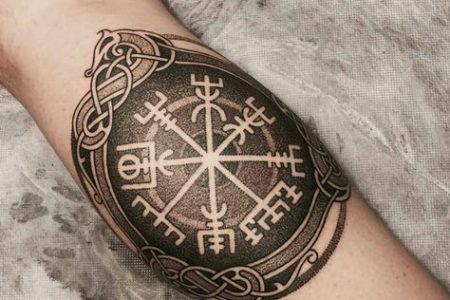 And as you can see, it is a beautiful tattoo with lots of symbolical meanings. Take a look at our selection below. We’re sure you will find some inspiration.